A tile roof was also typical of Spanish Revival houses. 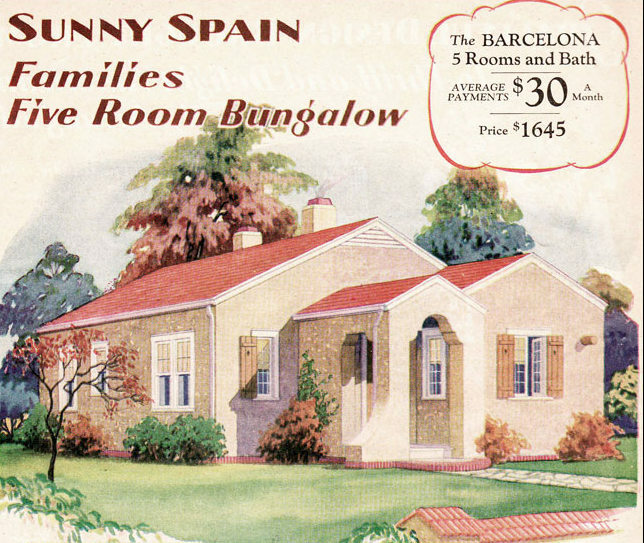 Montgomery Ward couldn't offer a tile roof and keep the price at $1645. However, they recommended that customers stain the cedar roof shingles red, for a slight additional cost. 3335 Phillips, Steger. Photo courtesy of Jill Grusak. This sweet Wardway Barcelona is in Steger. Clearly this Barcelona has a brick facade, not stucco, but brick was an exterior option on most Wardway models. The brick makes the house look less Spanish, but it's recognizable as a Barcelona even today. Thank you to Jill Grusak for taking a Sunday drive and getting house photos for all of us to enjoy. 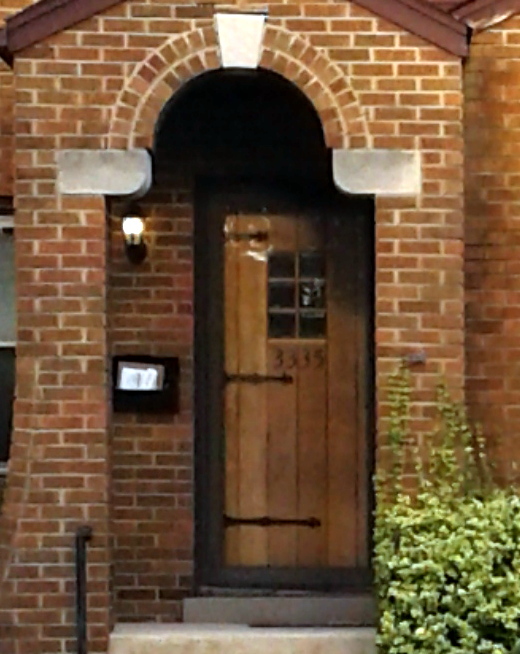 Close up of the original front door and the arch. Photo courtesy of Jill Grusak. Descriptions of the Barcelona interior. 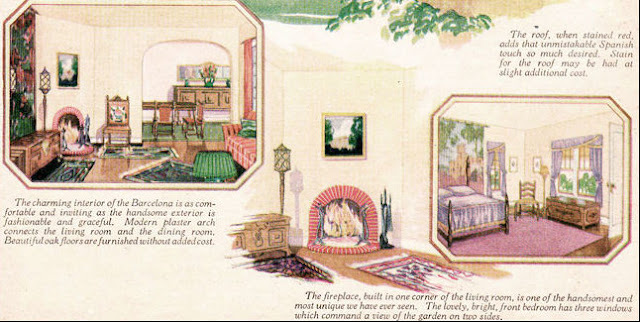 There are less than 10 Barcelonas in the national database of Montgomery Ward homes, and unfortunately I wasn't able to find suitable interior photos for any of them. 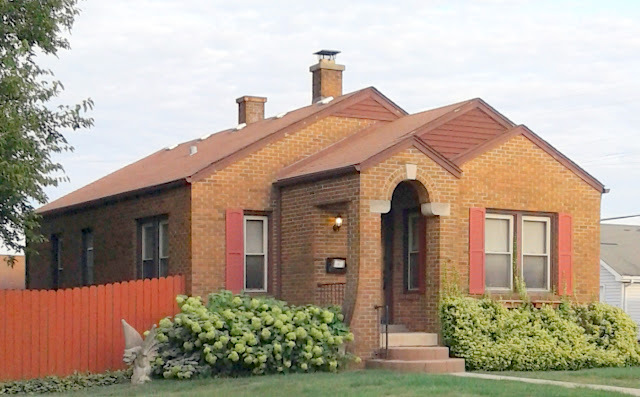 The Barcelona in Steger is authenticated by a mortgage record. I believe the original owners were Harry and Gladys Haskell. Harry was a tavern owner in 1940 and later owned a record store in Chicago Heights. Oh, it's great for us to see a close-up of the Wardway door's iron strapping! Hmmm. Brick just doesn't say "Sunny Spain" in quite the same way that stucco does! The arched entry has lost something in the translation as well, but it's still a sharp-looking house. I'm not surprised that someone altered the roof line in the front; that valley between the porch roof and the house looked like an invitation to leaks. Hi, Eric! Yes the brick "loses something in translation". But today many of the Barcelonas are stripped of all character and covered in vinyl siding (and sometimes they lose the vestibule). This house may not be Spanish-y, but it's still cute!